Long before Airbnb and the sharing economy came into vogue, Cubans have been renting out their spare rooms to tourists as casa particulares (private homes), a system which has become one of the highlights of the Cuban experience for visitors. In 1997 amid the economic turmoil of the post-USSR special period, and in a desperate attempt to earn some foreign revenue, the government relaxed the rules on private enterprise and created the casa particular system. This was a huge change in an otherwise entirely state-directed economy, and it provided a welcome source of income for many families. The system is highly regulated and registered casa particulares can be identified by a blue and white sign. 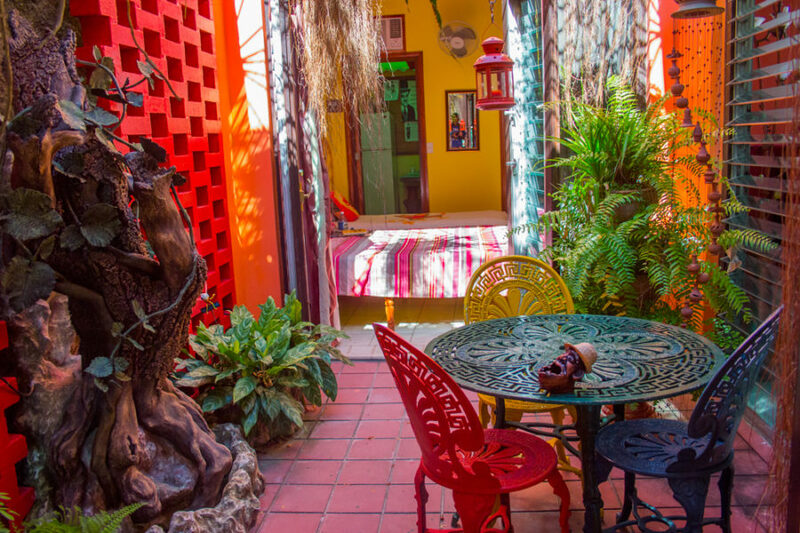 Casa particulares offer a distinctly Cuban combination of bed & breakfast accommodation. You can typically expect more privacy than a standard home share – most casas are in an entirely separate building, or in a private section of the main home. But at the same time, you’ll be living alongside a family who will be willing and happy to meet and spend time with you, giving you a fascinating insight into local life. As private homes they’re usually much more in keeping with the surrounding area than a hotel. In Trinidad or Havana you might find yourself in an original colonial house; in Playa Larga you can stay in a home on the beachfront; in the countryside you’ll find yourself immersed in Cuba’s rural beauty. Breakfast is usually included, with an optional home cooked evening meal. Casa owners take great pride in their hospitality. A big part of the experience is appreciating how resourceful they are, managing with so few of the everyday items we take for granted. As WiFi is still patchy in Cuba, one benefit of going for a casa is the help and advice you’ll receive from your hosts. This can be particularly helpful if you need to book taxis, find out more about local places or sort out onward travel. If you’re visiting Cuba to understand its culture and people, and are eager to meet the locals and learn about their lives, then staying in the country’s casa particulares will leave you with memories to treasure forever.